Todd Cochrane talks with Paul Meyhoefer, Vice President, J.K. 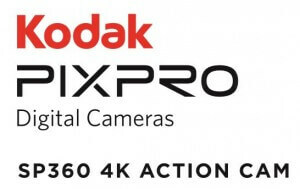 Imaging Limited, Kodak about the Kodak PIXPRO 4k action camera. 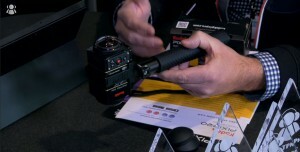 The Kodak PIXPRO 4k action camera uses a 4k sensor to record 360 degree video with a 235 degree band of view. The unit is able to use WiFi to produce a lower resolution live view on your Android or iOS mobile devices so you can check your camera aim. The device includes stitching software and editing software for both Windows and Mac. The unit can support up to a 128 gigabyte Class 10 (or higher) Micro SD card. An RF remote control is sold separately for $45. Underwater housings and other mounts are available for sale on the website. Kodak PIXPRO 4k pricing is $449 for the camera by itself. The Premiere Pack which includes various accessories is priced at $499. The Dual Pro Pack is priced at $899 and includes 2 cameras and accessories. The 360 degree videos produced are compatible with both YouTube and Facebook. Scott Ertz interviews Andy Peacock, head of content for 360Fly. 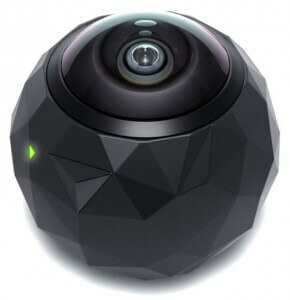 The 360Fly is a 360 degree high definition action camera shaped like a ball. The 360Fly cameras democratize the creation of virtual reality content for virtual reality viewers such as Google Cardboard and the Samsung Gear VR virtual reality viewer. There are now two versions of the 360Fly, the already available standard HD version that sells for $399.00, and the new 4K version that sells for $499.00. The 4K version should be available by the beginning of Summer. A couple of helmet manufacturers are also coming out with models that allow the 360Fly cameras to be securely integrated into their helmets. The helmets should also be available by the beginning of Summer. Video games have come a long way since the days of blocky bits bouncing ’round on a TV set. The unrealized dream of gaming has always been to transport the player to worlds otherwise unreachable in reality. And while gaming sound and graphics have improved dramatically, those improvements are still stuck on a flat, two-dimensional screen. French developers Immersis are working on a new projector system that brings gaming environments out of that two-dimensional state and into an entire room. Scott spoke with Daniel from Immersis. 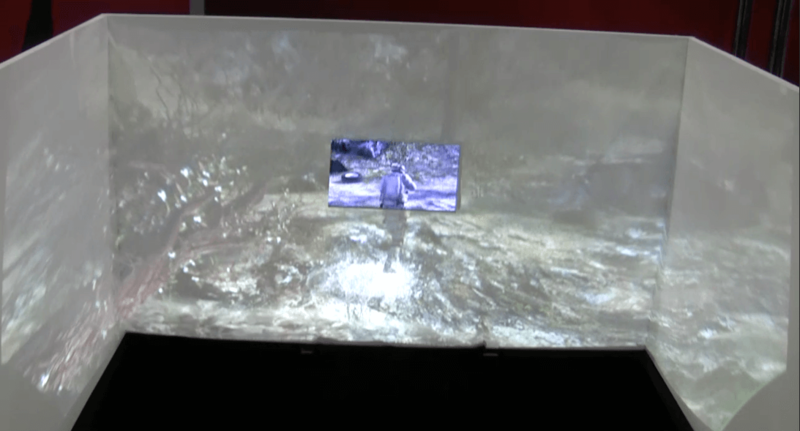 Daniel showed off a miniature mockup of the full-sized Immersis projector and he explained that the Immersis system will consist of the full-sized version of their special HD protector that’ll work with either a console gaming system or PC to project the gaming environment onto all of the walls surrounding a player, putting that player right in the center of the action. Immersis is launching the product thru Kickstarter and the company has already reached its goal of raising $100,000 thru the crowdfunding platform. Daniel believes that Immersis will be able to bring the projector to market by November of this year and that the retail price will be $2500.00. 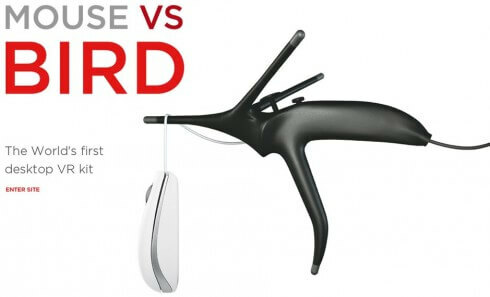 This looks more like an instrument of torture than any kind of bird I’ve seen but fortunately it’s not and it’s actually the virtual reality controller from Leonar3Do‘s desktop VR kit. 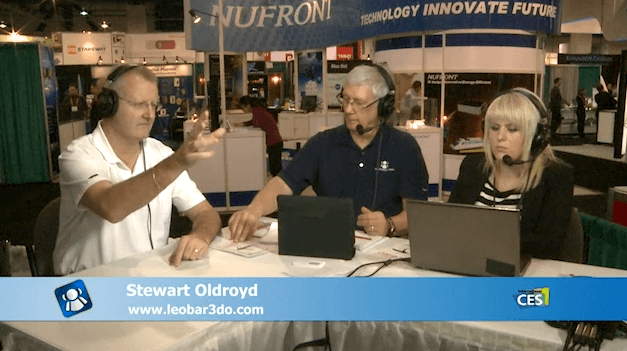 Andy and Courtney breathe a sigh of relief and chat to Stewart Oldroyd from Leonar3Do. Hungarian start-up have created “the world’s first desktop VR kit”, consisting of the scary controller above, 3D glasses and three line sensors that affix to the computer monitor to track the position of the controller and the glasses. There’s a video on the company’s website that shows the system in action and it looks amazing. The innovative part is that it’s an out-of-the-box environment which costs around $1500 rather the $10,000+ usually associated with VR systems. Currently only available for enterprise and education markets, the consumer version will arrive in late spring.